Welcome, Assistant Principal Deanna Nelson! 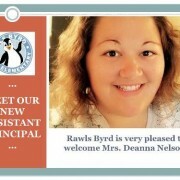 We are very pleased to announce that Mrs. Deanna Nelson has joined our family in the role of Assistant Principal. She comes to us from Hampton City Public Schools where she served as a data coach. Prior to that role, she spent 7 years teaching Kindergarten and a year teaching 3rd Grade. Mrs. Nelson is a Nationally Board Certified teacher and had the opportunity to serve as the summer school lead for her school in Hampton. She is a Pennsylvania native and attended Penn State University for her undergraduate degree. Her leadership degree was earned from The College of William & Mary. Mrs. Nelson’s work ethic, achievements and love for children and learning precede her. She has been impressive in her few weeks in the new role and will bring much to our learning community! When you come to Open House on Thursday, September 3rd, please be sure to meet Mrs. Nelson. She is looking forward to knowing and partnering with all of our families. https://wjccschools.org/ll/wp-content/uploads/sites/12/2015/08/RBES-NEW-AP1.jpg 375 500 Karen Swann http://wjccschools.org/rb/wp-content/uploads/sites/12/2014/05/logo.png Karen Swann2015-08-31 23:18:312015-09-12 09:12:37Welcome, Assistant Principal Deanna Nelson!